Jelly by Sam Bompas and Harry Parr is one of the most recent additions to my cookbook collection. 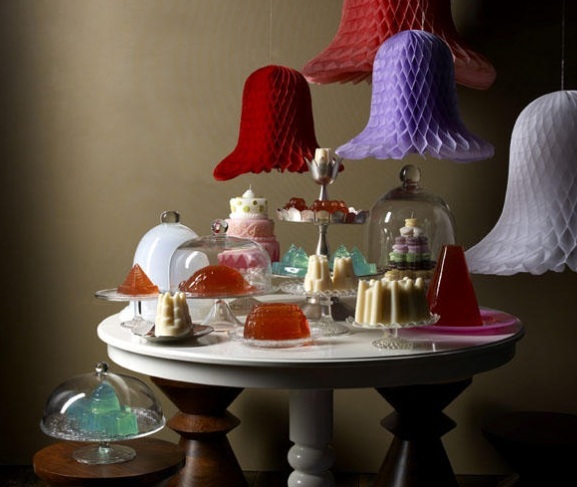 It is a book filled with wondrous creations from Bompas & Parr, who decided to start working as “jellymongers” in 2007. 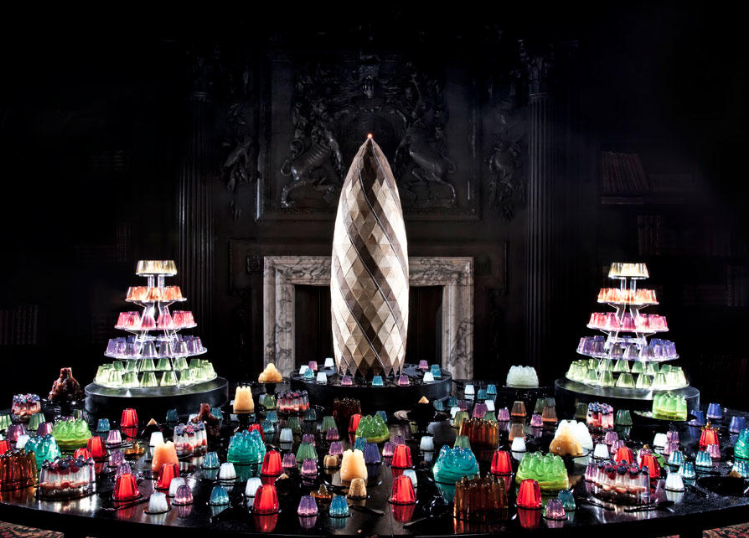 Bompas & Parr’s creations range from fairly standard to sublime, however they are all impressive. 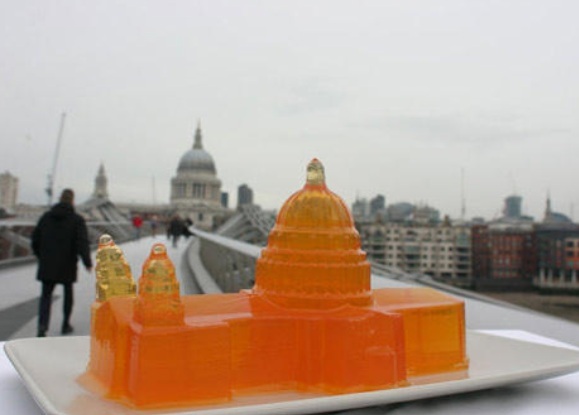 Standard creations are jazzed up – fresh fruit jellies in the shape of architectural wonders – while the most magnificent include glow in the dark creations, layered wonders or a suspension of gold leaf. These guys aren’t just limited to jelly though – they have other culinary skills perfectly suited to the sweet tooth. The gents have been inspired by Willy Wonka’s creations, creating chewing gum that changes flavour as you chew (blueberry pie anybody?) and scratch and sniff cards that are reminiscent of Wonka’s wallpaper. Although the recipes for these creations are not included in the gelatine based cookbook, there are so many photos and stories inside that you really get an idea of how creative and magical these guys are, making you think that jelly is simply the first food product of many that they have decided to master and reinvent. I decided to try my first recipe from their book last weekend – it was a warm spring day so I decided to make the Pimms Cup jelly in lieu of an actual jug of Pimms. I have to admit that I have only ever made jelly from a packet of jelly crystals before so I was slightly terrified at the thought of making an alcohol based jelly with suspended pieces of fruit that I needed to unmould. However, I was so excited with my success that I have now decided to attempt many more beautiful creations from this book. I think I will try the alcohol based jellies first and work my way from Mai Tai to Bubblegum Vodka to Champagne and Summer Fruit. Delicious! Recipe adapted from Jelly by Bompas & Parr, makes one litre of jelly for use in a jelly mould. If you choose to set your mix in glasses and do not wish to unmould them, you will only need 7 gelatine leaves. Pour the Pimms Cup, dry ginger ale and lemonade into a jug, add a squeeze of lemon juice, and stir. Resist drinking it!! Chop up the gelatine leaves and place in a heat proof bowl. Pour just enough of the Pimms mixture over the top so that the gelatine is covered. Allow to bloom for 10 minutes. Place the heat proof bowl over a small saucepan of simmering water to allow the mix to heat up. Stir until the gelatine has melted into the mixture. Add the remaining Pimms Cup liquid, stir, and then strain the mixture back into the jug. Put your jelly mould (or glasses) on a tray to make it easy to transfer to the fridge to set. 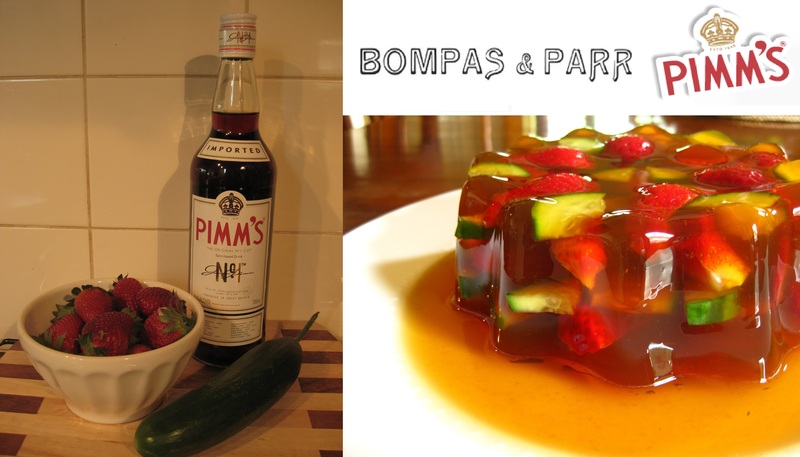 Pour some of the Pimms jelly mixture into the mould and add some of the cucumber and strawberries. Place the partially filled mould into the fridge for about an hour to allow it to partially set. Keep the remaining liquid and fruit at room temperature. Repeat the mould filling and layering procedure until all of the mixture is in the mould, in the fridge. Leave for approximately two hours to ensure firm (or at least, as firm as a bowl full of jelly can be).